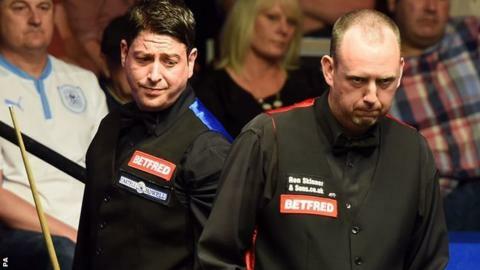 Matthew Stevens claimed a five-frame first-session advantage over fellow Welshman Mark Williams in a repeat of the 2000 World Championship final. World number 35 Stevens, vying for his first second-round place at the Crucible since 2012, claimed a 7-2 lead in a session littered with errors. The 35-year-old produced a 111 break to level at 1-1, a 96 to move 3-1 clear and bettered some close-fought frames. Elsewhere, Mark Allen beat Ryan Day 10-3 and meets Barry Hawkins in round two. Ronnie O'Sullivan awaits the winner of Williams and Stevens. The two Welshmen arrived in Sheffield with significantly lower rankings than they held when they produced a stunning final in 2000, which Williams claimed 18-16. The world number 14, who also claimed a world title in 2003, reached his first ranking event final in over three years at the Players Championship last month, but suffered defeat to Joe Perry. But Williams produced a highest break of just 22 before the mid-session interval and, with the score at 4-2, missed chances in a dramatic and error-ridden seventh frame. After Williams had gone in-off, Stevens missed a straight brown and later went in-off from the blue as the pair traded snookers. But Williams could not close out the frame, rattling a blue in the jaws of a pocket to eventually fall three behind. "Is there anything else that can happen in this frame," said commentator John Parrott. It formed part of a run of four straight frames won by 39 points or less for Stevens, who has not won a ranking event since the 2003-04 season. Elsewhere at the Crucible on Tuesday, two-time finalist Ali Carter claimed he is "here to win" this tournament as he progressed past Alan McManus. And Ding Junhui reached round two despite miscalculating his score in one frame to miss out on a 147 chance.